So I've covered a cart-based handheld, an all-in-one handheld, a multicart and a clone; you may be wondering at this point, is there an area of obscure low-budget Chinese console gaming I haven't yet poked my nose into? why yes of course there are several of them. but today I'll be taking a look into the magical world of the plug & play controller, a class of devices that predated (and have now been mostly displaced by) those aforementioned all-in-one handhelds. These began as straightforward Famicom clones which took advantage of smaller NES-on-a-chip hardware to dispense with the console and squeeze the whole package into a controller which plugged directly into your TV; possibly one of the first was the early/mid-90s IQ-901 from famiclone pioneers Micro Genius but the form was later popularised in the late 90s by the interminable N64 controller lookalikes like the Mega Joy and Super Joy and Power Joy (and probably some other types of joy), all of which came bundled with collections of very much unauthorised copies of old NES games. 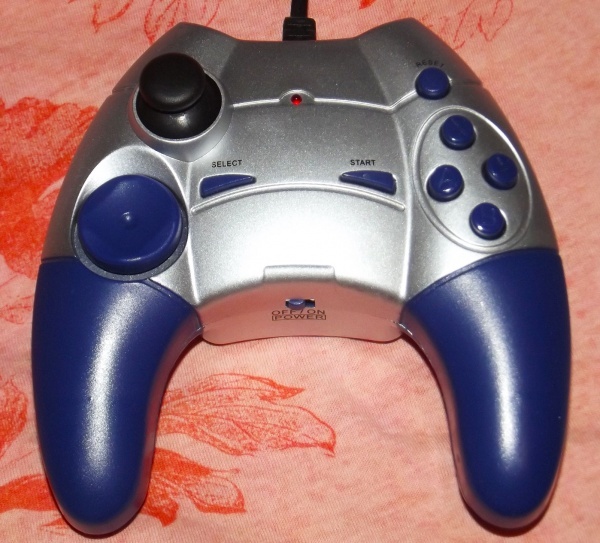 It was only around the early 2000s that plug & plays transcended the bootleg nature of the early stuff and went legit; in China the likes of Jungletac would start developing their own original games for Famicom-based systems, later branching out into more capable hardware from Sunplus and others, while in the US and Japan various companies got in on the act with a string of licensed releases. The one I've got here is a later example, running a rarely seen type of 16-bit hardware. I've decided to split it into a few posts, as it has quite a lot of games and I'm going to screenshot the whole lot (not least because it's much easier to take screenshots from something with TV-out than the handheld I covered previously) - in this post I'll just cover the packaging and console. So it's the Sunnyflyer 30 in 1 16-bit... thing! It also has a name in Japanese, ゲーム悍な将; ゲーム quite straightforwardly means "game" but as far as I can tell 悍な将 makes no sense, so there's that. 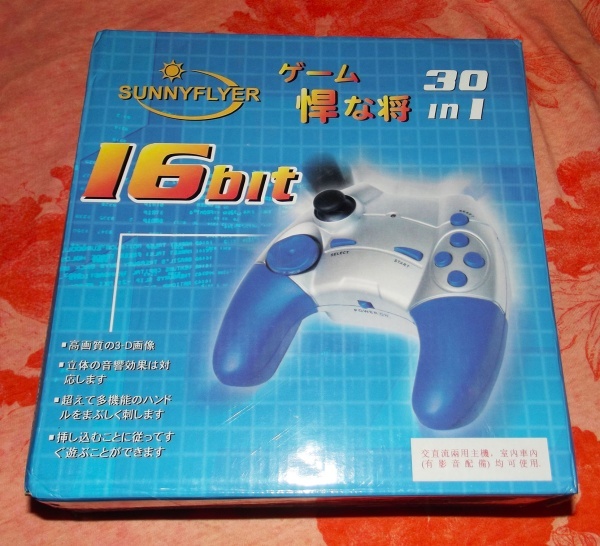 Sunnyflyer was based in Taiwan and spent most of its life as a maker of model planes - I have no idea why they decided to get into game consoles, but they did (albeit probably only rebranding from other manufacturers), and then seemingly went out of business shortly after. A lot of their old stock ended up on Taobao; there's a Sunnyflyer Famiclone that crops up there sometimes, and I've also seen a lone dance mat on a Taiwanese auction site. The back has a game list in traditional Chinese - this important information being in Chinese does kind of betray that the Japanese text all over the front is just for show (if that wasn't already apparent from it making no sense), and the console was probably intended for the Taiwanese market all along. 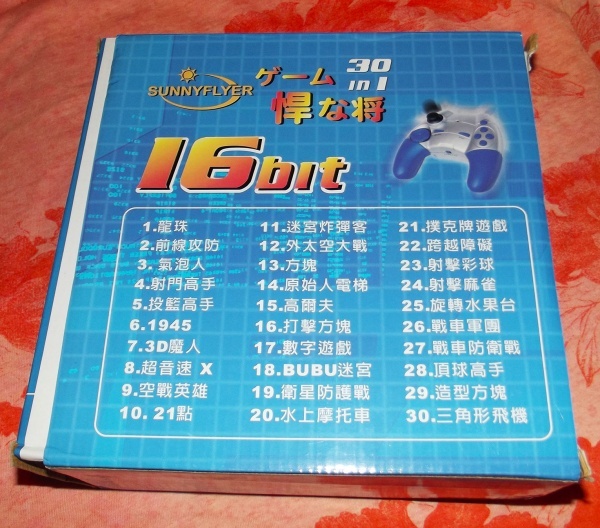 The top of the box identifies it as a "plus & play" system and illustrates a flipped version of the system plugged into a clipart CRT TV, and there's even more (probably nonsensical or stolen) Japanese text. And the bottom, with manufacturer/distributor details and such. The other two sides just have some screenshots of the games on here, which I'll be showing you later anyway, but have these as a ...preview, I guess. 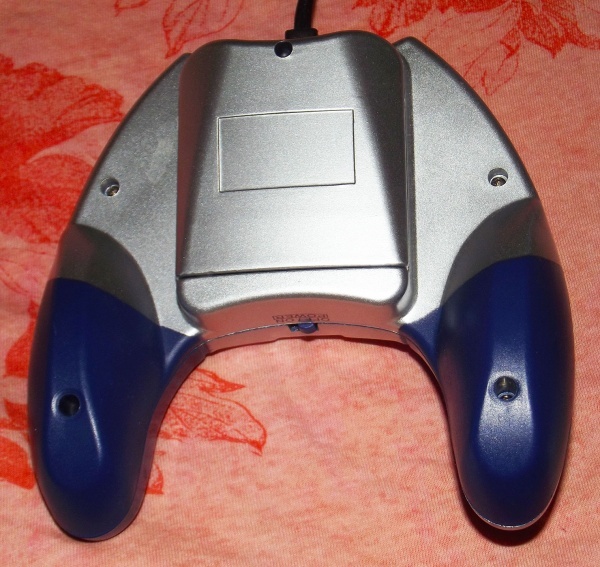 There's also the repeated text "EMG 2008 30 in 1 user gnide" which, aside from being misspelt and entirely out of place, handily reveals the year this thing was made and the hardware it runs; "EMG" is the series of game systems-on-chips made by Elan Microelectronics, the latest of which is EMG2000a, but this might use an older one. it is... a fairly ugly thing, to be honest. Control layout is quite standard - there's a little faux-analogue stick and a D-pad, plus A, B, X and Y buttons (though I have no idea if the X and Y buttons are mapped separately internally or they're just wired to A and B as is common on similar consoles - certainly no games on here do anything unique with them). 4 AA batteries go in the back, in that bulge which also helpfully makes it quite uncomfortable to hold. The battery life seems decent enough - it would be nice if you could use an AC adapter instead, but that's not the way of these things. Anyway! That's the externals covered (there was also an instruction sheet in the box that I forgot to take a photo of, but it is both uninteresting, brief and in Chinese so you aren't missing much), next up I'll get onto the games - stay tuned! That thing looks like a robot from a 50's B-Movie.